Whats This Generation Coming To? drinks served in plastic coconut shells, and Americans seemed willing to buy anything with bongos on it. wasn't a hit, although it is kinda catchy. well, who's gonna tell him? our video review and you can hear the songs by simply watching the movie. 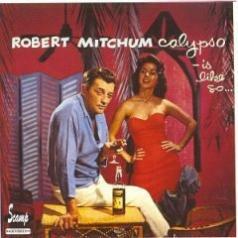 LP and a 1995 CD compilation, both titled That Man Robert Mitchum...Sings). today had he purchased Calypso Is Like So instead. Tramps like us, baby, we were born to limbo!! !